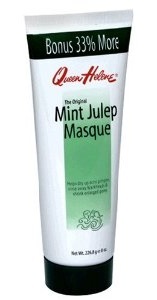 The Queen Helene Mint Julep Masque is one of my favorite face masks available. I first purchased it because I was looking for a mint face mask, and I really liked it and have purchased a few more bottles since. I love the tingling feeling it has when it is applied on my face. Once I remove it after 15 minutes my face feels so smooth and fresh. If you have really sensitive skin it might sting your face as you can really feel it working. The Queen Helene Mint Julep Masque is suppose to dry up acne pimples, rinse away blackheads and shrink enlarged pores. I’m not sure if it really does those things, but I sure love how it makes my skin feel after! It is a very affordable face mask, it is only around $5. I recommend trying it out for yourself. What is your favorite face mask? I’d love to hear, comment below.